Either a lamp or a goblet dating back more than 1,200 years, this restored, delicately banded piece of glassware was discovered by archeologist George Scanlon, lower right, who excavated in Fustat from 1964 to 1980. The Oriental Institute at the University of Chicago recently proved the truth of the saying that some of the world’s richest archeological sites are museum basements. Its 2015 exhibition A Cosmopolitan City: Muslims, Christians and Jews in Old Cairo introduced the urban world of Islamic Egypt, a world much closer to our own today yet often overlooked amid the spectacular wonders of the country’s deep Pharaonic past. The show focused on the now-obscure medieval city of Fustat through artifacts of daily life and items highlighting the art and literature of the period—many of which were brought newly to light out of the Institute’s own storerooms. Fustat was the city that grew from the military base of Arab conquerors who arrived in 641 ce, just nine years after the death of Prophet Muhammad in the Arabian Peninsula. It grew to eclipse the older, nearby city named Babylon as the preeminent city at the head of the Nile Delta, and as it grew, it gradually welcomed Christian and Jewish communities as well as Muslims from across the new Islamic empire. Cairo as we know it today was founded to the north of Fustat in the late 10th century. 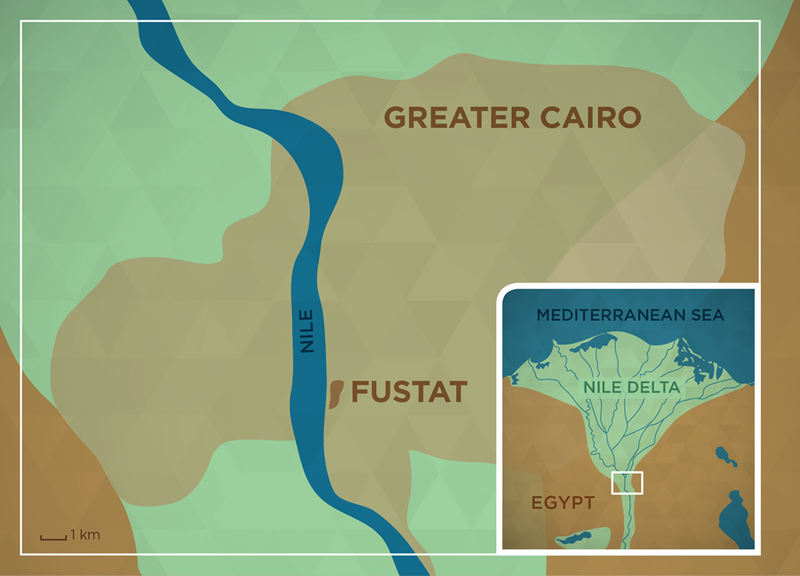 Fustat suffered from famine and fire in the 12th century and continued to decline over the next 200 years—but its core remained a vital industrial neighborhood. Today, Fustat is called “Old Cairo,” its surviving mosques, churches and synagogues a reminder of the time when the city was the cultural capital of Egypt. In addition to artifacts from Scanlon’s excavations, A Cosmopolitan City used manuscripts from the Institute’s collection and several pieces borrowed from other museums to explore the ways in which Fustat’s particular mix of residents lived in an Islamic capital for about 500 years, from the seventh to the 12th century—separated by both religion and languages including Arabic, Hebrew and Old Coptic, yet connected by a shared way of life. The exhibition considered questions of tolerance, discrimination, diversity and multiculturalism—all familiar themes today—in a setting most people know little about. Left to right The small, mummy-like, pharaonic statue, or shabti, dates to between the 11th and fourth century bce; the two dolls are carved from animal bone and stand about eight centimeters tall. Scanlon gave the Institute a number of artifacts from his 1965 dig, including the lamp or goblet as well as the doll at right. The story of the exhibition’s own genesis is no less intriguing, as much of the material was on public display for the first time. Vorderstrasse tapped the Institute’s database to identify possible Islamic items, and then she moved downstairs to open cases, boxes and drawers to see what was really there. She worked with Donald Whitcomb, associate professor of Islamic archeology at the Institute and the University of Chicago’s Department of Near Eastern Languages and Civilizations, with whom she had previously studied. Both were surprised to discover just how extensive the Islamic objects were. 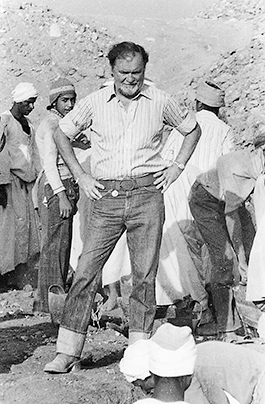 Scholars at the Institute had always been aware that it had received material from Scanlon’s Fustat excavations, though with the Institute’s ancient civilizations emphasis, no one had studied it. The arce had received artifacts from the Egyptian Department of Antiquities in exchange for sponsoring Scanlon’s excavations, and Scanlon himself gave other shares of objects to institutions that had supported him, primarily Princeton University and the Akron Art Museum. In 1983, Akron transferred its Fustat ceramics and other objects to the Oriental Institute. In 1986 a few items were published in a catalog of jugs, but for the most part these items, too—mostly pottery shards, coins, metal weights, small mummy-form statues called shabtis and the like—remained in the basement, cataloged but unstudied. 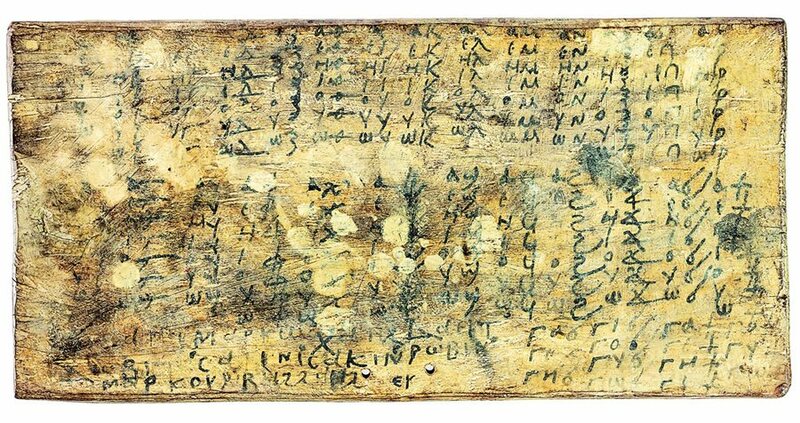 A wooden tablet with 18 lines of two-letter syllables in Coptic would have been standard classroom equipment for many children learning to write in Fustat. It dates to between the sixth and eighth century ce. 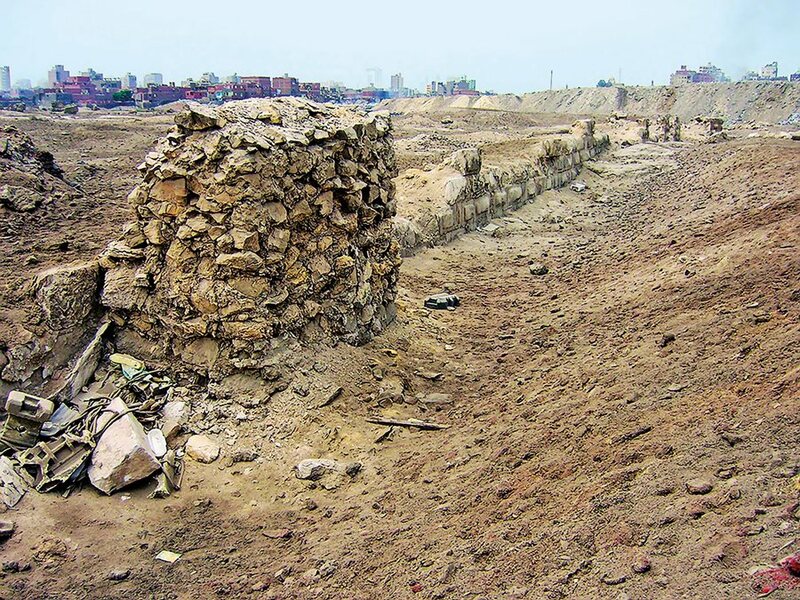 Fustat was partly burned in the late 12th century, and some areas were rebuilt within a wall encompassing that city and Cairo to the north; these excavated walls are believed to date to the period of Ayyubid rule, from 1171 until 1250. The Fustat artifacts, for all their significance, represented only part of the material that Vorderstrasse brought to light. She was particularly excited by a set of documents that were only described as having been purchased from a Dutch dealer who bought them in Cairo, with no further provenance. On closer examination, Institute experts believe they came from the genizah (repository) at the Ben Ezra Synagogue in Fustat, which contained thousands of documents, religious and secular, primarily from the 10th to the 13th century, making it one of the most important sources of information about the social history of the Middle East and the Mediterranean in the Middle Ages. In sum, only a few of the objects Vorderstrasse discovered had been published, let alone exhibited. Neither the scholarly community nor the public was unaware of their existence, let alone the stories they might tell. When Whitcomb saw Vorderstrasse’s discoveries, he urged her to propose an exhibition for the Oriental Institute’s museum. He connected her with Tanya Treptow, another of his former students, who had recently received her doctorate at the University of Chicago and had worked on other exhibitions in Chicago. It was a first step, and it would take two years to bring displays to the museum floor. This paper-and-ink page from the 1001 Nights, acquired by the Oriental Institute in 1947, is the earliest example of the famous tales and one of the oldest existing Arabic literary manuscripts. A legal document overwritten on one side of the manuscript provides the date of 879 ce, meaning the original must have been made prior to that. The first challenge was to determine a theme, a storyline that would make the exhibit meaningful to a modern audience while remaining true to the historical contexts of the objects. Then they probed museum professionals and members of the public with interest in Egypt to learn what a museum audience might already know, and what questions would best hook visitors. While most in both fields felt familiar with ancient Egypt, few recognized the name “Old Cairo,” and “Fustat” elicited only puzzled stares. 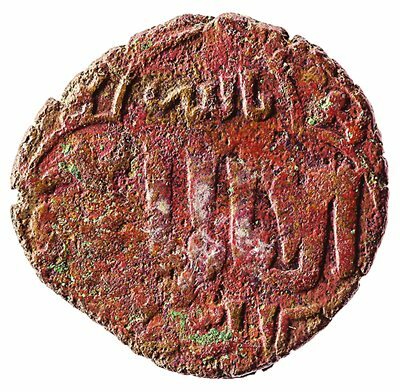 Top: This copper fals coin was minted to serve as small change during the reign of Sultan al-Malik al-Kamil (1226-1234). Above: Penned in Arabic script, this Hebrew writing exercise dates from between the ninth and 13th century, and it is one of many historic documents discovered from Fustat’s Ben Ezra Synagogue genizah (repository). What got interesting, says Treptow, were the questions that followed: “Who were these communities who lived side by side in Old Cairo?” and “How did they make it work?” These led to the exhibition’s overarching, ecumenically focused theme, which proved both more engaging and more sensitive than the broader questions with which the curators had started. For the most part, it is impossible to tell which objects came from a Muslim, Christian or Jewish household. The everyday objects from Scanlon’s excavations formed the heart of the exhibition because they demonstrated the similarities in the lives of Fustat’s Muslim, Christian and Jewish residents, explains Treptow. For the most part, it is impossible to tell which objects came from a household of any one of those communities. Everyone frequented the same merchants. Everyone ate much the same food. Everyone wore similar clothing, though texts tell us that some distinctive items were legally mandated for Christians and Jews—a fact that appears in the form of complaints that some among those populations were not complying. Only one piece of pottery has a religious symbol on it: A small clay flask is inscribed on its bottom with an equilateral cross, indicating it would have belonged to a Christian. 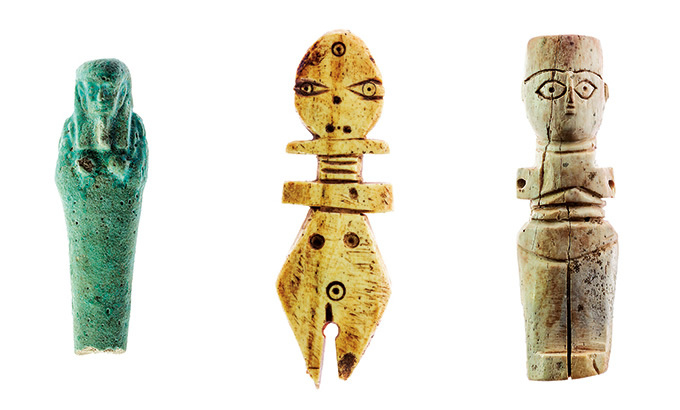 Left to right: A small white stone mold for a metal bird figurine that measures 5.5 centimeters tall, a necklace beaded with turquoise glass and a sandstone candlestick carved in the shape of an elephant, 16.6 centimeters tall, all demonstrate the decorative arts of Fustat. All come from Scanlon’s 1965 dig. Because the special-exhibits gallery is small—not much bigger than a studio apartment—Vorderstrasse and Treptow settled on 75 display items, balanced between everyday ones from archeological sites and art-historical and intellectual ones to showcase the communities’ beliefs and differences. Among the latter were fragments from the Qur’an, the Bible and the Torah, a bowl fragment depicting the deposition of Christ and a door from a Torah shrine obtained on loan. Then, how to impart a sense of lived experience behind mostly small, fragmentary artifacts? No mummies, no monumental sarcophagi, no gold. Nor many people: Almost none of the domestic artifacts from Fustat includes human representations, except for a few small, abstract dolls. How, then, to humanize the past? To bring alive the manuscript page from alf layla wa layla (1001 Nights), the curators gave it a voice—using an iPad. For example, a manuscript page from the alf layla wa layla (1001 Nights) from the Institute’s collection is one of the most important objects in the exhibit. 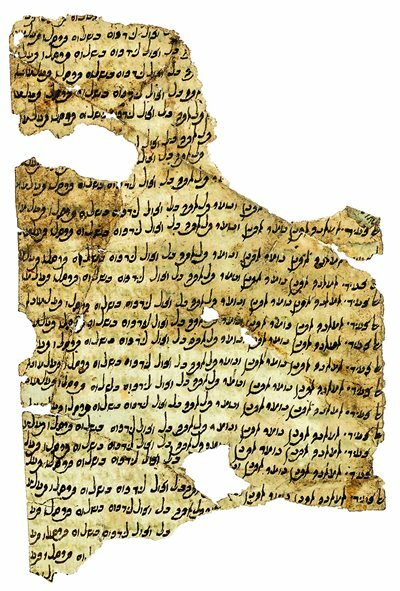 Dated to earlier than 870, it is the oldest known example of the famous tales and one of the oldest known literary manuscripts in Arabic. The calligraphy is well drawn but difficult to read. 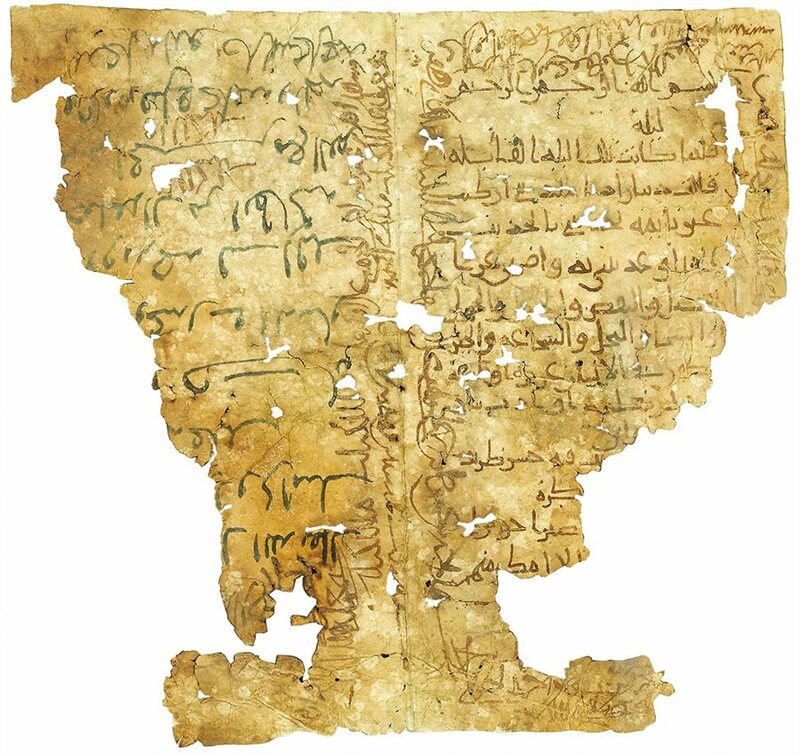 The fragment is dirty, it has holes in it, and it was overwritten in later centuries by people who used it as scrap paper. To bring it alive, Vorderstrasse and Treptow gave it a voice. They mounted an iPad on the case that allowed visitors to click on a translation of the Arabic script. They did the same for other objects. For cases centering on everyday objects, the pair selected related written material of the period that had personal touches. One iPad for one case played varied reactions to the city recorded by two newly arrived visitors; another voiced a letter by a worried mother to her child who was on his own in the city. Left to right: Fustat became a center of Mediterranean and Indian Ocean trade. Although there were certain religious proscriptions, Fustat’s residents by and large had a shared cuisine, some of which was surely served on this glazed bowl. A fragment of a richly decorated fritware bowl has an equestrian design; it may have been displayed on a wall. A brightly dyed band of woolen tapestry, 31 centimeters long and dating between the eighth and 10th century, shows a profusion of human, animal and floral decoration. Another display included music from the period, thanks to one of Vorderstrasse’s other talents: She recorded her own interpretations, played on the harp. She quickly found that of all the audio offerings, it was the Arabian Nights fragment that was the most popular. “That was one where the battery was always low,” Vorderstrasse says. “The tours I led helped confirm we had hit on something important with our themes of Muslims, Christians and Jews,” says Treptow of the exhibit that ran for seven months; it included a lecture series and a live program for adults and families celebrating the history and culture of Old Cairo through music, hands-on activities and poetry. Among scholars, A Cosmopolitan City and its accompanying catalog was a “little jewel of an exhibit” that worked as “a nerve node to bring scholars into conversation with each other,” says Marina Rustow, professor of Near Eastern studies and history at Princeton University, who participated in the show’s lecture series. The catalog brought in new voices offering perspectives on the period that were both deep and broad, she says. For example, she adds, the staff asked for her opinion about a manuscript of the Hebrew Bible written in Hebrew using Arabic letters with Arabic commentary—an unpublished document with untapped potential. Enlisting scholars this way is the first step to stimulating interest and securing funding to conserve previously underutilized objects, she points out. This, in turn, can bring in more scholars interested in the Institute’s Islamic collections. Teeter is counting on just such a scholarly domino effect. Vorderstrasse’s research did far more than update records, Teeter explains, adding that she “re-unearthed” an important part of the collection. Pamela Toler holds a Ph.D. in history from the University of Chicago. She is the author of Heroines of Mercy Street: The Real Nurses of the Civil War, scheduled for release in January in conjunction with the PBS series Mercy Street.